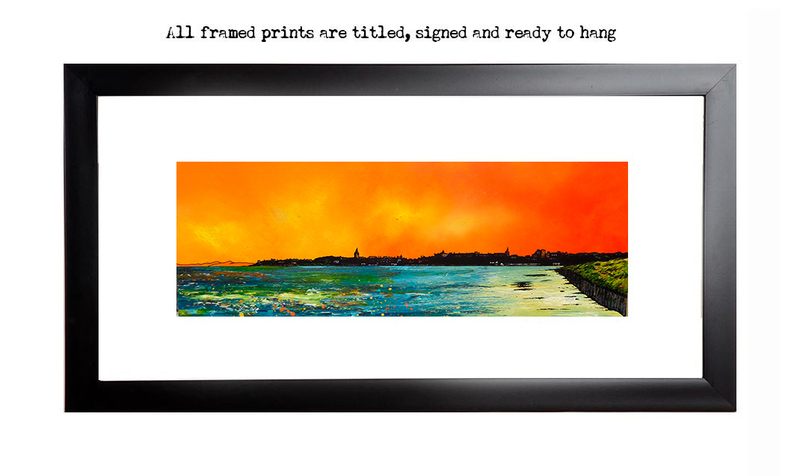 An original commissioned painting & prints of St Andrew’s Beach at Sunset, Fife, Scotland. An original abstract, atmospheric seascape / landscape painting of the beach at St Andrew’s, Fife at sunset, Scotland. A dramatic mix of mediums are blended layered and splattered over the canvas to produce a very atmospheric painting depicting the ever changing wild weather that constantly sweeps across the home of golf, Scotland’s East coast & Highlands from The North Sea. This painting was commissioned by a client, if you would like a specific scene painted have a look here and just get in touch. Scottish landscape painting of St Andrew’s Beach, Fife, Scotland. Prints also available to buy. Paintings & prints of St Andrew's - St Andrew's Beach Sunset, Fife, Scotland.